The simple answer to this question is, the better the soil the healthier your plants will be. Home made compost is the most cost effective and rewarding way of improving and fertilizing your garden's soil. Whether you grow vegetables or fruit, flowers or just have a small lawn, the rotted organic matter applied once or twice a year will show good results. It also acts as a mulch in helping to retain moisture, which with our reduced rainfall each summer can only be a bonus. Another good reason for composting is the fact that all landfill sites are rapidly filling up and a lot of your daily rubbish can be recycled simply and quickly at home for your benefit. What is compost and how do I make it ? Quick and effective odourless (if your compost smells sour something is wrong) composting relies on the correct ratio, approximately 25 parts Carbon (brown) ingredients, to 1 part Nitrogen (green) ingredients along with Oxygen and Water. This is where us humans get involved in 'mother natures biodegradable chemistry lab', by mixing our waste ingredients at the correct ratio of about 25:1, keeping the heap just damp (never wet), and frequently turning it over with a garden fork to aerate it (no more than once every 5 days). Along with the optimum core temperature of 60 ºC (140 ºF) which generally happens naturally if all the above factors are correct. We get a lovely crumbly compost we can use all over our gardens in a fraction of the time than would happen naturally. Hopefully as quick as 3 months or so. A good way to get your compost started is to add a layer of healthy garden soil over the top of the heap, or to add male human urine which is Nitrogen rich or plenty of manure. Cut grass Nitrogen Try and mix with carbon rich materials. Increases core heat of compost. News paper Carbon Shred as finely as possible. No glossy magazines. Wood ash Carbon Very small amounts only. Very rich in potash but also very alkaline. Carbon Very rich in nutrients. Chop small. Allow to dry a little before use. Weeds Nitrogen/Carbon No roots or seeds and cut up very small. Best left to dry before adding to heap. Cardboard Carbon Non glossy and shred as small as possible. Manure Nitrogen Herbivores only. The best ingredient by far. Increases core heat of compost. Vegetable/Fruit peelings Nitrogen Chopped small will rot quickly. Lint and hoover bag contents Carbon Only domestic waste. Carpet sweepings and tumble dryer lint. Pet and human hair Nitrogen Cut up small and mix in well. Slow to rot. Saw dust Carbon Non painted wood only. See table below for ingredients NOT to use. Cat/Dog droppings and litter trays Dangerous pathogens that may not get killed by the composting process. Coal/Charcoal ash Acidic and rots very slowly. How do I get a compost bin and where do I put it ? Compost bins come in all shapes and sizes so finding one to fit your garden and needs should not be a problem. Most garden centres sell them, a search on the 'web' always brings up thousands of results, and your local council are generally very keen to supply them at reduced cost as they lessen the burden on landfill sites. Alternatively you could make one yourself. See image below. 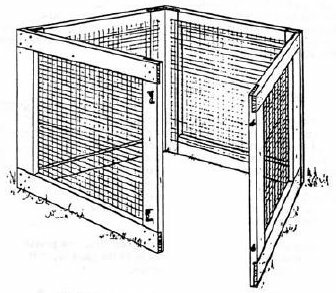 The image shows a simple construction of pressure treated wood and small-mesh wire, about 1 metre square works well. This allows quick filling, easy turning for aeration and should maintain a decent core temperature which is essential for rapid decomposition. This type of compost bin can be moved around the garden to wherever it's needed most. I have a pile of 'lovely crumble compost' what do I do with it ? Use it. On your flower beds layer about 50 mm thick, dig it into your vegetable plot as much as you like and on your lawns a thin coating mixed with sharp sand will be all the grass desires. The best time to use your compost is in the Autumn or early Spring. 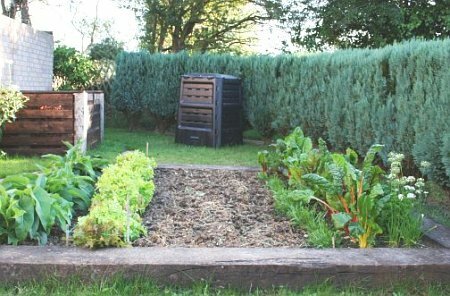 Gardeners and farmers, often careful with their money have known the benefits of cheap organic compost for many years. It fertilizes, conditions your soil, retains moisture and adds essential bacterior back into the ground, what more could your garden ask for.